I thought I would make yet another version of the three pocket scissor holder because it is indeed a handy little project to keep all of your sewing scissors together in one place. This is an easy project that uses only a fat quarter of fabric, some batting, a pattern and some standard sewing supplies. If you need any of these items feel free to head over to Fabric.com or Hobby Lobby to get everything you need for this project. Print out the pattern pieces. Abut them together and tape. Lay the pattern onto the fat quarter and cut 2 pieces making sure that one is a mirror image of the other. Cut one of the batting. 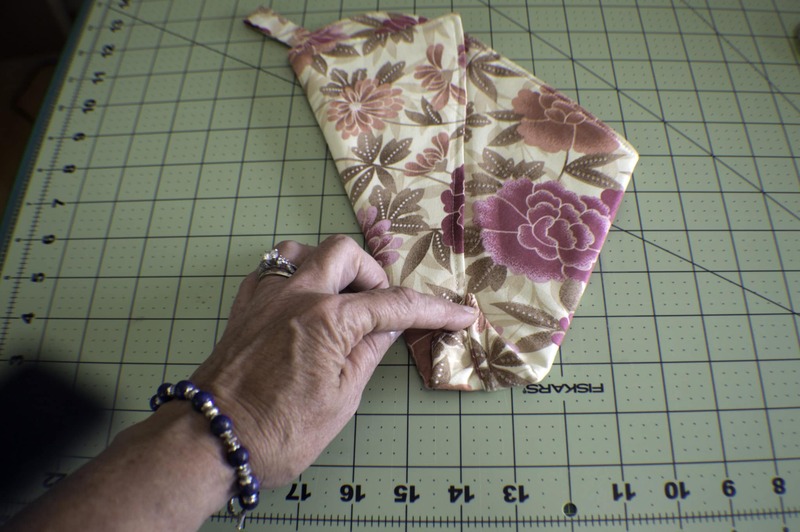 You will notice that there is a 1/4″ seam allowance included in the pattern. Place the fabric right sides together with the batting on the outside. Make sure to add your ribbon loop at the markings on the pattern. Instead of ribbon, I made a fabric loop to match my fabric. You could also use a piece of bias tape if you have some on hand. Sew all the way around and through all layers leaving a 2″ opening at the bottom for turning. Clip the corners. Turn Right sides out and fold under the fabric at the opening. Press well. Top stitch around the perimeter. Lay the piece facing right sides up and fold the short side to the long side and press. Fold half of the previous fold back on itself and press again. Open up the first fold so that both folds are facing down. Then fold the left side over. Fold up the bottom point to square it off and press. Fold the previous two folds back toward the left fold so that there are now three pouches for the scissors. Clip the sides together and sew up both sides of the piece enclosing all of the folds. You have now completed your three pocket scissor holder. If you would like more sewing and crafting projects please sign up for my newsletter and get your free list of sewing room must haves. This post contains affiliate links that if you click on them and make a purchase I may receive a small commission at no extra charge to you.